Die Bauanleitung einer Holzmiete gibt es hier auch in verschiedenen Sprachen. In naher Zukunft kommen weitere Übersetzungen hinzu. 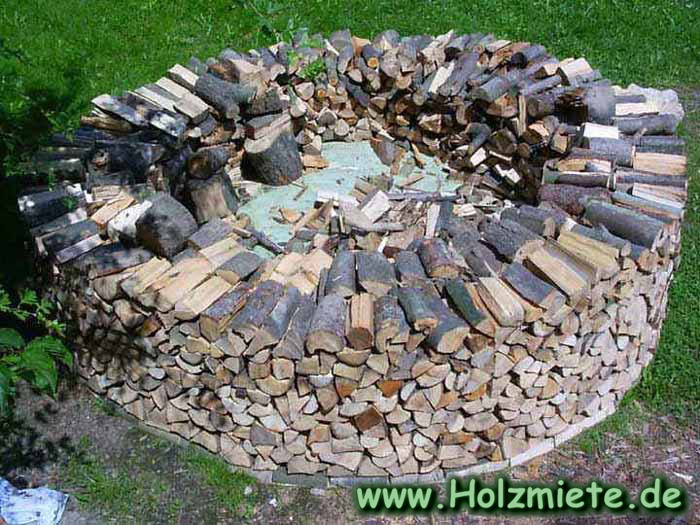 Instruction "Holzmiete" – Just a Pile of Firewood ? 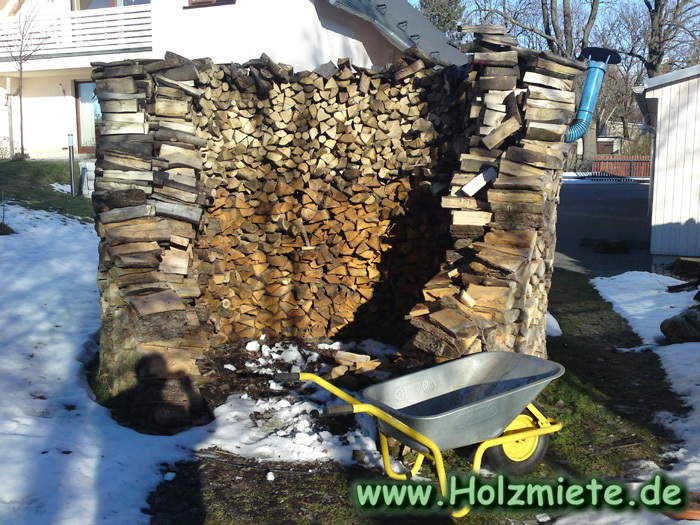 Building a "Holzmiete" needs both creativeness and craft skill. Be your own architect and – this is unique – you are so free to build your own fine piece of wooden architecture. And what is even more fascinating you can destroy it . Destruction for giving you warmth and comfort during the icy season of the year. Unbelievable but true – WOOD, lots of WOOD. But do not chop down your neighbours` trees! This might be the end of all your endeavours. O.K., you have legally gained your WOOD, which is still just a PILE OF WOOD no HOLZMIETE, not yet. First of all put a cling film on the ground which is larger than the diametre of your“holzmiete“. Then measure the central point of the cling film and fix the point with a screwdriver. Tie up a piece of rope around the screwdriver. Now transfer the radius wanted for your "holzmiete" to your piece of rope with the help of a folding rule and fasten a felt – tip (water proof ) on its end. Go around and paint a circle on the cling film. Mind the cling film should be even and the rope taut. Avoid water seeping into the cling film by perforating it in a twenty – centimetres` space. Choose smaller pieces of firewood and put them on the line painted on the cling film (crosswise to the centre) . This is the basis of the outer ring. Start piling up the pieces of wood lying across on the very edge of the circle. Because of the statics your construction should gently slope towards the centre. Pile the first layer of firewood as correctly as possible to guarantee an even ground. If you start piling the outer ring, it is advicable to extend the pieces of wood slightly outwards the outer ring. After having piled up the pieces of wood of about half a metre, use the back of your axe and hammer them into the outer ring. Avoid collapsing your“ holzmiete“ by letting your construction slightly bend inwards. Do not forget to fill the empty space in the middle with pieces of wood while piling the outer ring. You may cut off the cling film extending outwards with the help of a very sharp knife. 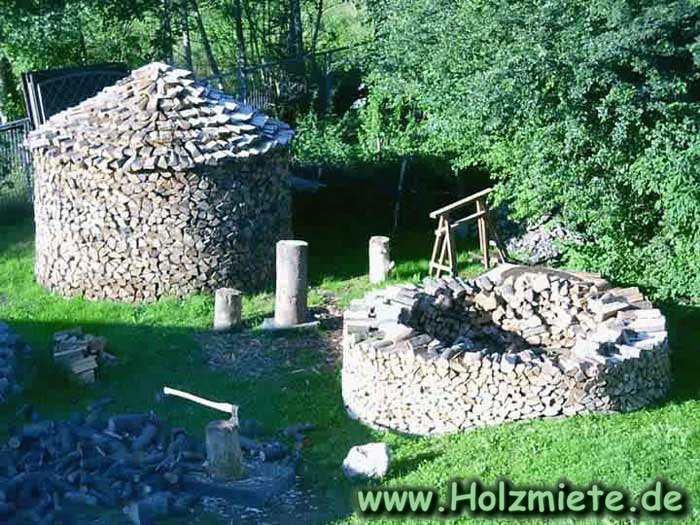 If you have reached the height wanted for your“holzmiete“, top up the hollow space in the middle of your“holzmiete“ to such an extent that it towers above the final point of your construction. Use longer piles of firewood and stack them up the same way as you would roof a house with shingles. Mind! The angle of inclination should not be too steep but enough to let the rainwater flow down. Safety first! Build a scaffolding around your beloved "holzmiete" if you are not absolutely sure of your architectural triumpf. So sorry – Or what a pleasure ? – Your fine piece of wooden architecture has to be seasoned for two years at least. Congratulation !- You have done it. You have created your own fine piece of wooden architecture – it is your masterpiece . Haven`t you got a feeling of joy, happiness and satis faction ? If not, don`t build a second "HOLZMIETE". cubic content: 13.38 cubic metre = cubic content of truncated cone and circular cone. - the truncated cone has got a diametre of 3.00 metre down, 2.86 above and a height of 1.60 metre the roof as a circular cone has got a diametre of 3.00 metres down, 2.68 above and a height of 1.60 metres the roof as a circular cone has got a diametre of 3.00 metres and a height of 1.10 metre. You can do these calculations quite easily with the help of ' Formel XXl ' - a complete collection of formulas. Start with the back of your beloved “holzmiete“. This way you keep the front side good looking as long as possible. Do it as if you took a piece of cake out of the whole. Then take the pieces of wood from the centre of your "holzmiete" Step aside if your pieces of firewood are faster than you., from time to time. The better you have built your „holzmiete“ the better it will stand your“destruction“. By the way, very dry and cold weather is really good for destabilizing the firewood. GOOD LUCK ! – HAVE FUN ! – HAVE A NICE TIME !